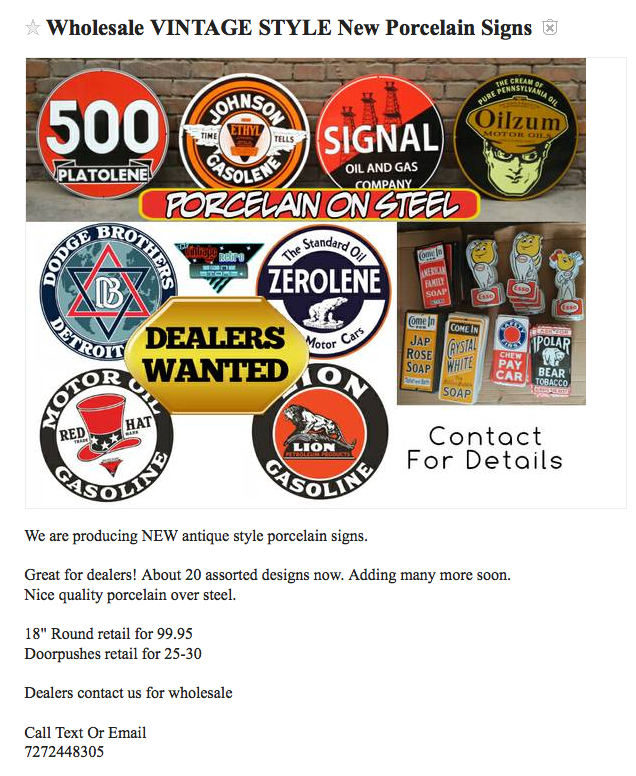 Register Log In Primarily Petroliana Shop Talk Forums Online Auctions, eBay Craigslist Petroliana "Wholesale VINTAGE STYLE New Porcelain Signs"
They are covering the country with them on Craigs List. Have seen them in my area for quite a while too. Its pathetic... but money talks. Last I knew oilzum was an active trade mark meaning they would need a licensing agreement to use it. Maybe someone should contact mark owners asking they be marked reproduction so crooks will need a bigger hammer. The bigger problem is foreign forgeries made the old way and hard for experienced dealers and collectors to tell. Oilzum is still in business. Well the name is owned by a local oil company up this way. I think I'll send em an email with the link to this guys website. See how they feel about it..